An antibiotic-resistant Salmonella Reading outbreak is linked to raw turkey, so with Thanksgiving approaching, many people are concerned. One person in California has died. The states with the most illnesses are Minnesota, Illinois, Texas, and New York. This outbreak is serious because officials have not been able to link it to a specific product. They simply say that “raw turkey products from a variety of sources are contaminated with Salmonella Reading and are making people sick.” So cook turkey from the frozen state! Using this method, you will avoid any cross-contamination issues with turkey juices dripping around your kitchen. This method is approved by the USDA. I got this information from Dr. O Peter Snyder, a former food science professor at the University of Minnesota. With this method you don’t have to order the turkey far in advance, or worry about thawing it correctly beforehand. You should cook pre-stuffed frozen turkeys using this method. Start five to five and a half hours before you want to eat for a 12 got 12 pound turkey. Larger turkeys will take longer to cook. You can estimate about 50% more cooking time with this method. To cook turkey from the frozen state, first set the oven temperature to 325°F. Unwrap the turkey but don’t worry about the giblet package frozen inside. Put the turkey, breast side up, on a rack in a shallow roasting pan. The pan must be shallow, but with sides high enough to hold juices as the turkey cooks, so the heat can move easily around the bird. The sides will shield the bottom portion, which cooks more quickly than the breast, from the heat. And be careful that you are putting the turkey in the pan breast side up. I made the mistake once of putting it breast side down and had to throw the whole thing out. 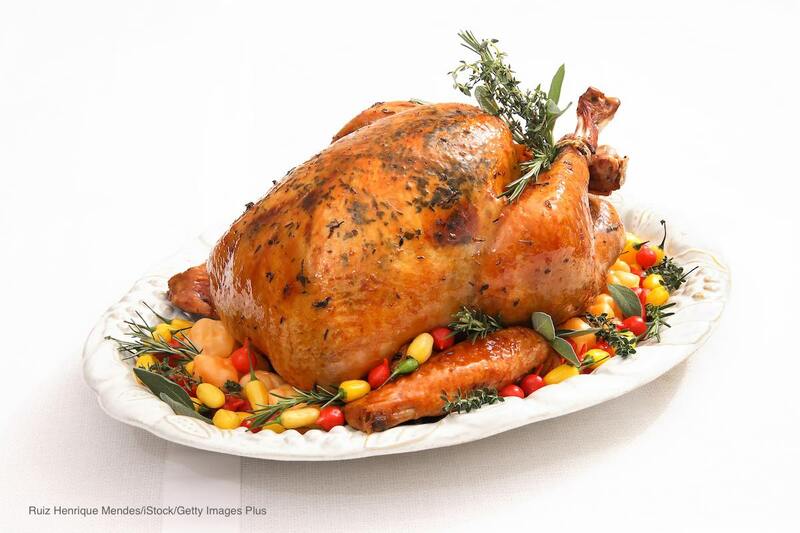 Wash your hands well after handling the turkey because it is likely contaminated with bacteria. After 2 to 2-1/2 hours, the legs and thighs will be about 100°F. The breast will still be “soft frozen,” but you should be able to insert a meat thermometer at this point. Put it into the breast, making sure it doesn’t touch the bone. After about 3-1/2 hours, you will be able to remove the bag of giblets. Use a tongs to get the bag out. Use it to make gravy or stock. At this point you can stuff the turkey if you’d like. Be careful because parts of the turkey will be hot, and the pan, of course, is hot. Wash your hands again! At 4-1/2 to 5 hours, the turkey will be nicely cooked. The leg and thighs should be 175 to 185°F, and the breast should be 160 to 170°F. If the turkey had a pop-up thermometer, it should have popped. This method to cook turkey from the frozen state is reliable and tested. The turkey should stand, covered for 20 minutes after cooking so the juices redistribute. This also lets the stuffing cook a bit more. Take the stuffing out of the bird and put it into a separate dish. Check the temperature to make sure it’s 165°F; if not, put it in a pan and heat it in the oven. Then carve the turkey and enjoy. I find that the bird is more juicy and tender when cooked using this method. And you won’t have to worry about food poisoning from the bird this Thanksgiving. If you or a loved one have been sickened with a Salmonella Reading infection after being exposed to raw turkey products, please contact our experienced attorneys for help at 1-888-377-8900.